It's hot, you're barbecuing (if you're lucky/not too hot), and you're reaching for that singularly American wine that can stand up to high fructose corn syrup, apple cider vinegar, and Heinz 57. Naturally, your thoughts drift to Riunite on ice. But ZAP (Zinfandel Advocates & Producers) suggest you drift a little further. Right now there might not be a more underrated source for Zins than the Dry Creek Valley. There's a certain thumb print that the better Zins from that area have and, damn if it isn't just incredible. It is the next frontier for distinctive wines of consistent caliber and Zin is its crown jewel. So, with a grill about to overflow with smoked meats and all the trimmings, a tasting panel was hastily assembled to review three Zins from Dry Creek Valley and another from just plain old California. 2007 Fritz Dry Creek Valley Zinfandel $20 Smoothest texture and most gently agreeable. Lovely, especially after a little time. 2007 Lake Sonoma Dry Creek Valley Zinfandel $16 Best value and all around good guy. Great spices. 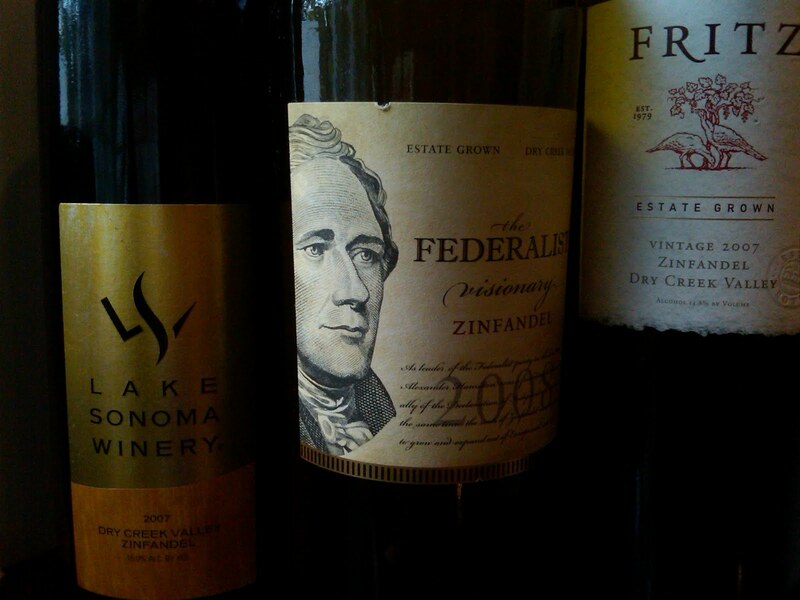 2008 The Federalist Dry Creek Valley Zinfandel $25 Friendliest fruit and most transparent reflection of the Dry Creek Valley. 2009 Big House Zinfandel California 'Cardinal Zin' $10 (Not pictured, but also available in a box.) On first approach it's cheap tasting, but improves dramatically after a couple of hours. Bright, friendly, and fruitier than Ricky Martin. Not in this line up, but reviewed previously, is Quivira's Zin. It's worth mentioning because, at $20, this remains not only the best value, but the best overall Zin from that area.